Happy Monday, I hope all is well in your part of the world. Have a great day and new week! During our road trip, I was happy to meet blogger Mary in Kentucky. This is the link to Mary's blog. She is sweet person, We met at a Cracker Barrel restaurant off of Rt 71 on our way to Mammoth Caves National Park in Kentucky. Thanks again to Mary for the nice lunch, I am so glad we could meet. On 5/4 we made an early morning stop before leaving Ohio. Nearby was the Clear Creek Covered Bridge and the Clear Creek Metro Park in Rockbridge Ohio. This chicken was in the park near Lake Ramona. This was a birdy area, saw the American Redstarts, Common Yellowthroat Warbler, Catbird, Bluebirds and Chipping Sparrows. 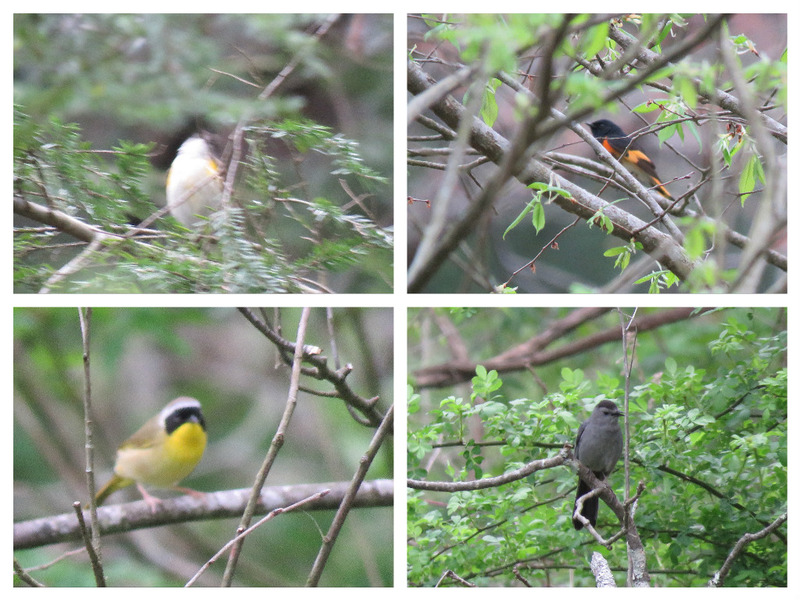 Some of the birds we saw were the male and female American Redstarts, Common Yellowthroat Warbler and Catbird. I am sorry the photos are not the best, they moved quickly and were camera shy. 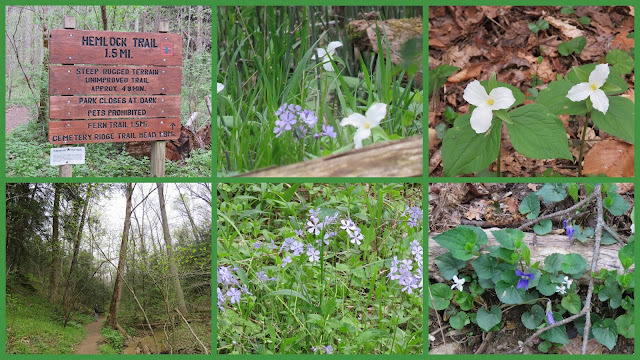 We took the Hemlock Trail for a little distance, there were many wildflowers, a little creek and the hemlock trees. I hope you enjoyed my post and photos. I hope to see you there. Thanks to the host today. Enjoy your day and new week ahead. That's a special bridge. Very special to see in that area. Your shots are well taken. Belas fotografias e gosto muito daquela ponte. How many blogger “meet ups” have you had through the years? Covered bridges are a great idea . Happy Monday to you, Eileen! The area seems quite beautiful, and the covered bridge is so pretty! May I point out, Eileen, with great respect I may add, that the bird is a Common Yellowthroat not a Common Yellowthroated Warbler. What a beautiful park!The Covered bridge is so impressive ! Great images of the lake,and the cute chicken ! Beautiful birds and wildflowers! So nice to meet with your blogging friend! I’ll visit her blog ! Thank you for sharing! Have a lovely day and a happy week! thanks for the comments: Marco, Franciso Manuel, Lynne, Tom, Chica, Merle Ella, Luisella and Dimi. Thanks David, I made the correction for the Yellowthroat. I knew just a typo. That covered bridge is great. How fun to meet, and then have such a nice walk in a nice area. Enjoyed your flowers and bird pics and love that quote about flowers being our friends. They do bring a smile. Thank you. What a grand excursion! And meeting a fellow blogger was the cherry topping! Beauty in the flowers/birds/scenery! Thanks for letting me tag along. You always seem to find great birds, Eileen! That covered bridge is beautiful! Helloo, So nice to read your post. Awesome photos. Have a nice week ahead. That is quite a modern looking bridge. Always love your bird photos. How lovely to meet a fellow blogger and what wonderful photos you got from another beautiful place ~ Love the bridge shot! I'm so ready for a hike. Dang this cold. looks like another great place to visit!! such an interesting covered bridge and beautiful, colorful birds!! and how nice that you were able to meet a blogging friend, i'm glad you enjoyed the visit!! Wonderful birds! I love the bridge you show. They are very beautiful. Oh, Eileen what a lovely post ... so nice that you were able to meet up with Mary ... I've just been over to her blog. Great pictures here and I do like reading the quotes you use too. What a lovely covered bridge! That's such an old style new built bridge. I love the catbirds songs! Beautiful shots, particularly the covered bridge! It's fun to meet a fellow blogger. I'll have to check out Mary's blog. Great discoveries, you found some genuine treasures. That is so true about the clean water! Beautiful photos, Eileen. Thanks for sharing them with us. I got quite into covered bridges when I was in the States last year. This is a very impressive one. Thanks Eileen for sharing your trip. Nice pics of the bridge, water, and birds. I have only lived in Kentucky since 2015 so I have lots of places I want to visit. Great inspiration. I like the quotes you use lately. I always love to see those beautiful covered bridges. Lovely birds and the flowers too. What a beautiful place and to start off at a Cracker Barrel with a blogger friend is a great start! Just reading "Cracker Barrel" had me craving one of their breakfasts even though it is dinner time for me, lol! Always fun to meet a fellow blogger. How sweet to meet another blogger - and what wonderful photos you've given us to enjoy. Hope your week is fabulous! It is nice to see the metro bridge. It would have been a wonderful time when we meet our friends. Sounds that you all had a wonderful lunch. I enjoyed all the nature photos. I do love wildlife, birds and nature. Enjoy your week Eileen. Thank you Eileen, I enjoyed your photos and you do find the neatest places. I aslo enjoyed Mr. Okakura’s quote. Happy day to you. Beautiful part of the country, I cannot wait to explore it. Our friends live in Kentucky and I believe this is the year we get to visit them. Great to see a chicken roaming freely by the lake around Ramona! Beautiful images Eileen, the first one, makes me think that it is a hide. Brilliant the birds. Looks like a beautiful place ! I love the covered bridge ! I am always drawn in by photos of rivers...they speak to my heart. My father wrote two books about the rivers of British Columbia, where I lived for most of my life. Like my friend Penelope Puddle, I enjoyed seeing the chicken out for a stroll! It looks like a very pretty area. I love that covered bridge. That is lovely that you met Mary. Thanks for your comments on my blog. Hi Eileen, lovely photos as always. How nice you met a fellow blogger! Thanks for stopping by my blog. I appreciate your kindness! I guess that chicken wanted to see the world (: I've only seen one covered bridge but aren't they cool? I always love your nature photography.. So glad you had a wonderful time -- and a blogger meet-up, too! Love the covered bridge. And all your quotes are spot on!